Heartfelt Italiana Riviera has arrived! Happy Heartfelt Wednesday everyone! Today is the big day, it’s time for the newest release from Heartfelt Creations the “Italiana Riviera Collection”! It’s time to slow down the daily pace, take a deep breath and embrace life with the new Heartfelt Creations Italiana Riviera Collection. We invite you to stroll down the Italian coastline taking in the spectacular seaside views, open markets, and amazing architecture while allowing yourself to relax and get lost in an easy going way of life. Feel the gentle breeze, breathe in the aromas of salty mist and mouthwatering eats as you pass by a harbour lined with delightful cafes and quaint little shops calling out to you to pause for a visit. Step through towering stone gates to meander through perfectly manicured vineyards boasting rows and rows of coiling vines filled with dense foliage andplump clusters of exquisitely purple hued grapes. Then as the sun sets, continue to take in the old world charm and beauty of the area as you relax in your villa, enjoying a glass of fine wine aged to perfection while jotting down all of the days wonderful adventures on an old fashioned postcard, pausing occasionally only to peer out the old stone window that reveals the most surreal view of lush gardens, stately mountains, beautiful flowers and that perfectly manicured vineyard. 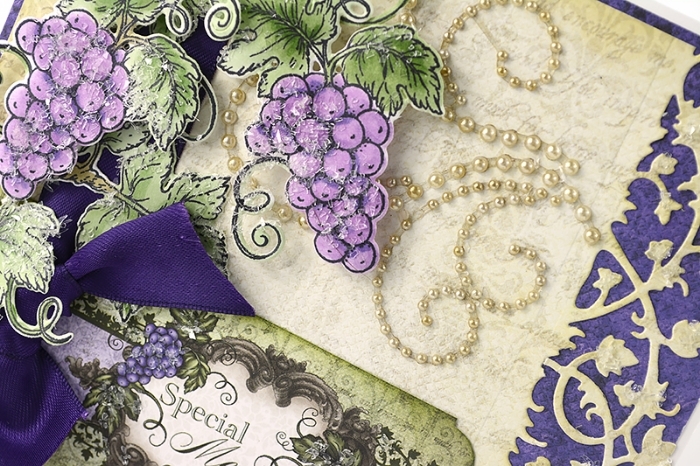 At Heartfelt Creations we dismiss the misconceived notion that you are required to leave your craft room to experience the finer things in life…so come along with us as we invite you to explore the charm and elegance of the Italiana Riviera Collection! 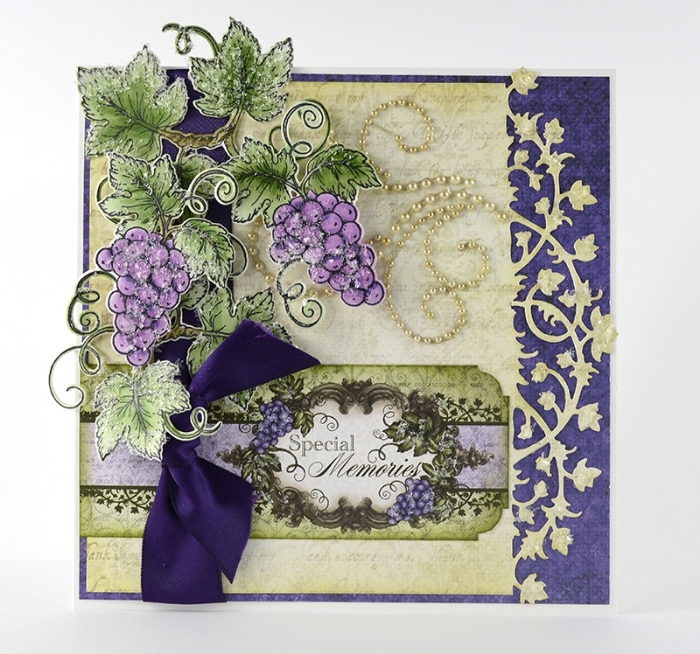 The Italiana Grape Clusters die is a beautiful accent design that can be used in many ways! 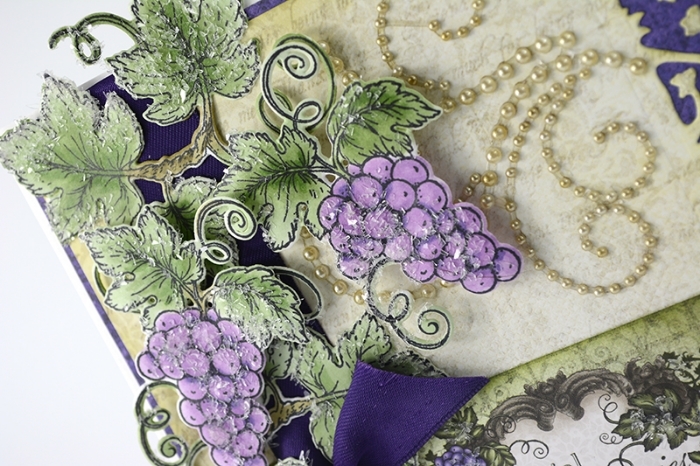 My card features the beautiful Grapevine and Grape Clusters stamps along with their coordinating dies. 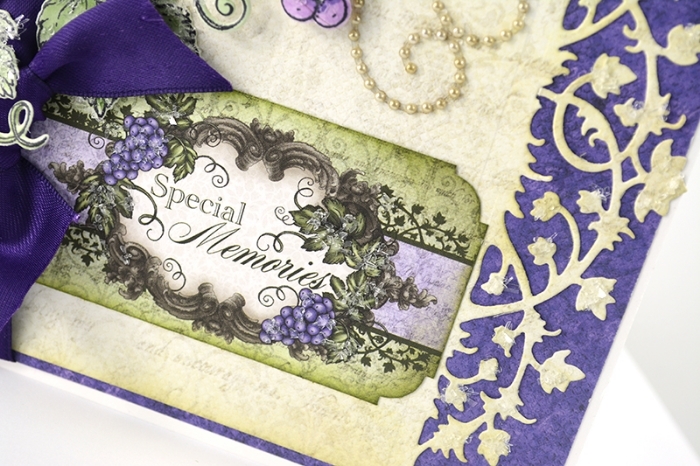 The papers in this collection include sentiments, tags, layout pages, card panels and much more! Be sure to stop by the HC shop to see the entire collection! Plus the HC blog has tutorials and many projects to inspire you! Have fun with the Italiana Riviera Collection and thanks for stopping by!